I shall keep his name as an example that one does not need to be republican or democrat to understand other people. To hell with bipartisanship that grinds the machinery of the democratic and republican party. To hell with the fear of certain types of republicans that did defeat many, including Abraham Lincoln, as a start. I shall keep the proposal for a humane immigration law, the type of law that Senator John McCain had and was not approved. Why did the America have to send those to the war in Vietnam, prioritizing impoverished African Americans and Latinos? That was John McCain III. He certainly was an atypical republican, like that of Abraham Lincoln. Two democrats gave true testimony of the greatness of Arizona Senator. The ex-president Barack Obama and the one who aspired for the nomination as candidate of the democratic party in the past election, (and the one who the democratic party's machinery did not let him be, and therefore today we have this much mud in the white house) the senator of Vermont, Bernie Sanders. 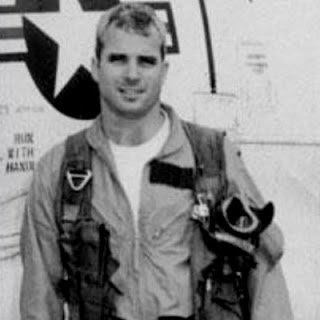 I am not sure that senator John McCain fits into my ideal of a hero of the American "style". What I do know is that he fits into my ideal of humanity. Peace to the body of senator John McCain. Me quedo con su nombre como muestra de que no hay que ser ni republican ni demócrata para entenderse con la gente. Al carajo el bipartidismo que blande la maquinaria del partido demócrata, y, también el partido republicano. Al carajo el miedo de cierto tipo de republicanismo que sí vencieron muchos, incluyendo Abraham Lincoln, para comenzar. Me quedo con la propuesta para una Ley migratoria humana, la del Senador John McCain y que no fue aprobada. ¿Por qué había que enviar a la Guerra Vietnam, prioritariamente a latinos y a afroamericanos pobres? Ese era John McCain III. El si era un republicano atípico, como Abraham Lincoln. El expresidente Barack Obama y el aspirante a la nominación como candidato por el partido demócrata en las elecciones pasadas, (y que la maquinaria demócrata no le dejo ser, por eso témenos hoy, estos lodos) el senador por Vermont Bernie Sanders. 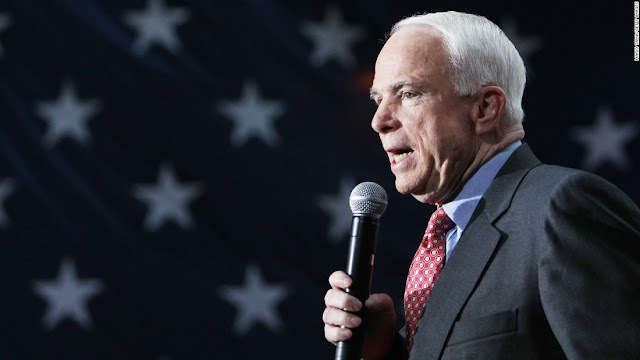 El senador John McCain talvez no entre a mi ideal de héroe al "estilo" Americano pero si en mi ideal de humanidad. Paz a los restos del Senador John McCain.